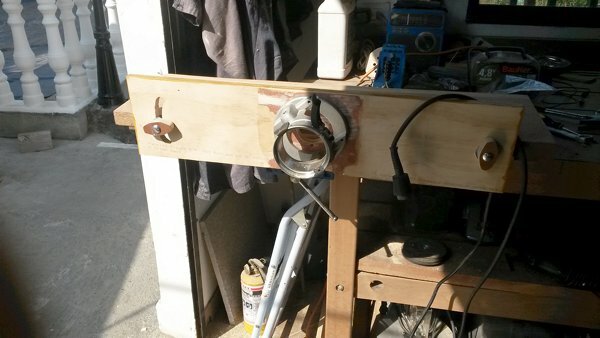 An Englishman in Colombia: Router Table Version No.3 !!!!! Router Table Version No.3 !!!!! 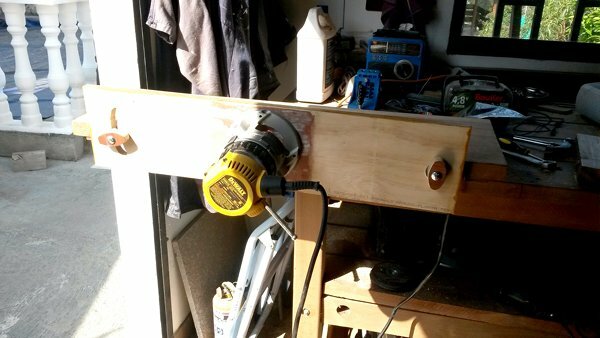 I decided that although I use my router regularly, I don't do anything complicated, so a simple router table that can be packed away after use is ideal. I have taken an idea from 'poroldchap' on Youtube, and made a couple of small changes. 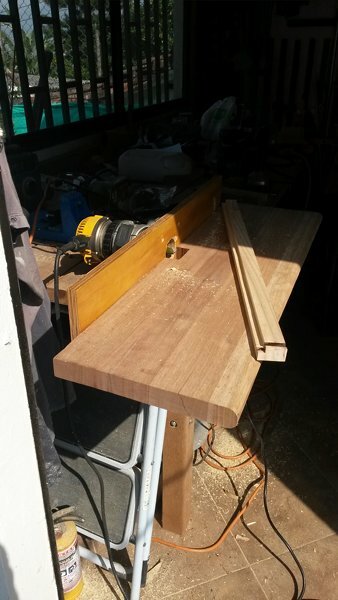 The whole unit only comprises of a hardwood base, with another piece attached underneath to fit in the vise, and a 3/4" plywood fence/vertical table, I bought a hardwood stair tread 12" x 30" ( I'm not sure what timber it is, but the sawdust was a killer. It ended up at 12 x 27), and the plywood, I recycled from my previous version. This shows the completed 'table', or maybe router shelf is a better description! and a the first test cut! 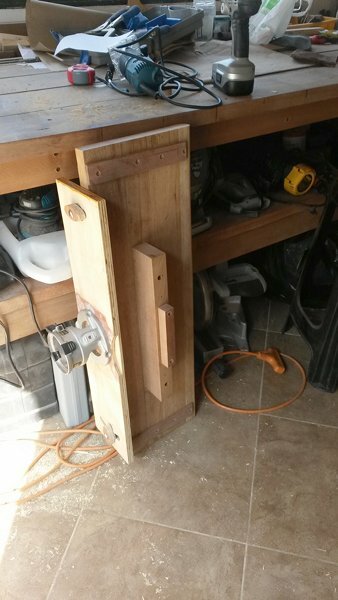 A photo of the rear of the unit, I used my DeWalt fixed router for this, it is definitely the better option, because I can just wind it in it's stand to adjust depth in one direction, also as you can see, at one end there is a bolt through the plywood into the hardwood, this acts as a pivot, (this was one change I made from the original design, 'poroldman' put bolts all the way through his base, I drilled into the base from the back, inserted a T-nut) we don't have bolts that long here! The other end is slotted, this nearly drove me bonkers, because it has to be curved, and I had to keep cutting more and more away to stop the bolt binding, but it works now. One handy thing about using this DeWalt Router, is that I can remove the cable from the unit itself, which is great when changing the bit, I can also remove the body of the router from the frame, which makes it easy for storage. And finally a view of underneath, there is the clamping bar, which sits in the vice, once in, it is as solid as a rock, and there is a small spacer bar screwed to the clamping bar, which aids in getting the correct height in the vice. Once I have finished I unclip the router, and put it under the bench, then remove the table and place it...I haven't decided yet, but it has a very small footprint. I am pleased with it, I just have to remember, that the bit can now be adjusted in two directions, one by winding the router in and out, and two by moving the back board up and down, also because of the design, you run timber from left to right, and not as you would on a traditional table. Yes, I am pleased with this version, and for once, all thanks to a fellow Brit!! !